We’re finally on the last day of a series far too ambitious for my own good! Broken Age is a point-and-click adventure game with some celebrity voice actors, with the first part releasing in 2014 and the second part in 2015. The Framed Collection is a collection of puzzle noir games, the first from 2014 and the second from 2017. Serial Cleaner is a funny action/ stealth game from 2017. I’m almost free! Twitch Prime (a part of Amazon Prime) is giving away 21 free games to subscribers, so I decided to check them all out for just one hour each and give my early impressions in exactly 200 words. You can check out my reviews for Pillars of Eternity, Q.U.B.E. 2, Battle Chef Brigade, Metal Slug 3,Twinkle Star Sprites, The Last Blade, Manual Samuel, GoNNER, Next Up Hero, Uurnog Unlimited, Hue, Deponia Doomsday, Observer, Tacoma, The Bridge, Brutal Legend, The Red Strings Club, and Tyranny in the included links. Yeah, it’s a lot of games. This game and Deponia Doomsday seem to have the opposite problems. While Deponia Doomsday had overly obtuse solutions to problems that seemed nonsensical, Broken Age’s solutions are always clear, although perhaps a bit too neatly presented, taking away any need for critical thinking. This might improve as the game progresses, however. 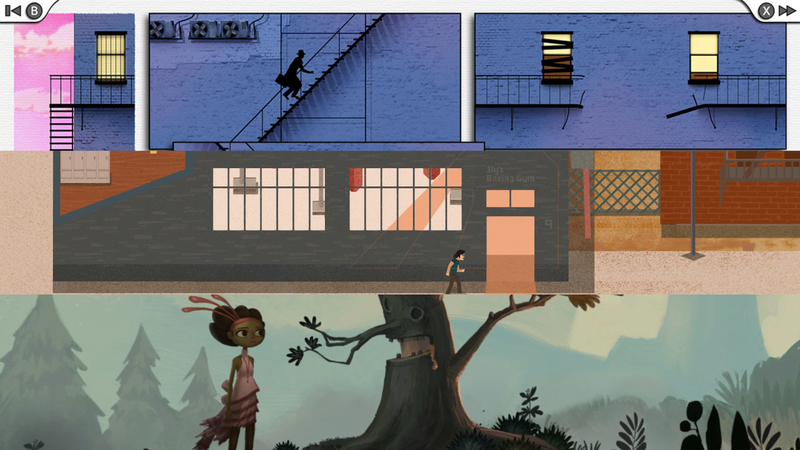 Broken Age has a more colorful art scheme, with everything looking like a painting. This combined with the largely one-dimensional cast of characters can make the game seem too childish at times, however, which is at ends with its occasionally dark or suggestive humor. The story follows two completely different characters: One is a maiden who is about to be offered up to appease a giant monster, while the other is a boy inside a spaceship convinced that it’s his mother, not unlike the Disney TV movie Smart House, of all things. In my limited playtime, I found the girl’s path more interesting, so I progressed a bit further in her storyline. They both certainly had their moments of humor, but the overly simplified point-and-click mechanics combined with an uncompelling cast, even with the two main characters, makes this far less compelling than the vexing yet lively Deponia Doomsday. I planned to spend half an hour on each Framed game, but the first was so engaging that I ended up spending all of my time on it, getting to the credits! The entire story is a simple cops-and-robbers plot, although there’s some confusing time-travel or parallel universe stuff towards the end. I’m probably overthinking it. Framed opted to forego all sound effects, instead having a dynamic soundtrack for whenever a character moves, fires a gun, or does any other loud action. It’s all set to a jazzy soundtrack that sounds like it came out of a heist movie, and it’s fantastic. The actual gameplay sees your character, who changes throughout the game, run through a series of frames (get the word-play?) that you can switch before or occasionally during an action sequence where the character runs through each frame in order. You’re allowed to try out each sequence as much as you want with no penalty, encouraging you to tinker around with the different tools at your disposal. I might not have gotten to play any of Framed 2, but the first was so impressive that it would be a fantastic game even if it was half as good. It might be full of dark humor, but this game isn’t messing around. In fact, you’re cleaning up the mess! (Alright, that’s enough puns from me.) Set throughout the 1970s, with a cheesy soundtrack and characteristically colorful art scheme to go with it, Serial Cleaner sees you work for the mafia, but instead of doing any of the killing, you’re getting rid of the evidence. But this is far from easy. Your three usual objectives are to remove pieces of evidence such as guns and notebooks such by going over to them, removing bodies by carrying them to your car, which slows you down and makes it so you can’t hide, and vacuuming up a certain amount of blood, which makes noise. The guards have a clearly defined area of vision, and mainly patrol or turn in place unless they notice a disturbance. If they notice you and you don’t make it to a hiding space quick enough, you’ll restart the entire level, which can be quite the setback in later stages, although the collectables are randomized to offer more variety. This encourages careful consideration of each move, and while it can be stressful, it can also feel incredibly rewarding. Broken Age, The Framed Collection, and Serial Cleaner are all currently available for free through Twitch Prime until July 31st. Aaaaaaaaaaaaaaaaaand that’s a wrap! I’ve spent a total of 21 hours playing 21 games, and many, many more writing about them and editing it all together. But even if I should have really just done one or two per post, this has been a fantastic writing exercise for me doing tiny reviews.